House and time at Malvern: No 6, 1893 - 1898. Died: 19 December 1919 aged 39 in United Kingdom. Died from gas poisoning at Frevent. Born: 12 Dec 1879. Son of Dr. G. B. Faskally, Umzimkulu, Africa, b. 1880. Army Side—Modern II. School Prefect. Ledbury Cap; House XI Football; Lieutenant in Corps. 1899. 5th Royal Dublin Fusiliers. 2nd Lieutenant. Permanent Address: 70 East 66 Street, New York City. Address for Correspondence: 31 Hill Street, Knightsbridge & 9 Hill St.
25 Jan 1918. Debility report. He has lived in the Tropics and has had Malaria in 1910. On Jan 8th 1918, he went sick with severe headaches, vomiting but no Pyrexia. Blood examined for Malaria but nothing found. He came home 21st Jan. There were no physical signs but his eyes are defective and glasses are to be worn. 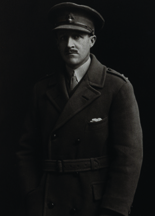 He held a commission in the 23rd Royal Fusiliers and was demobilised in March 1919. Shortly after he proceeded to Poland as a Staff Captain on General Haller's staff, was invalided home in October and died from Pulmonary Tuberculosis and Exhaustion at the 3rd London General hospital on the 17th December 1919. In proud and ever loving memory of Capt Percy Blake Faskally 24th Royal Fusiliers. Younger son of the late Surgeon Col. And Mrs. Faskally. He was severely gassed at Frevent in France and passed over on the 17th of December, 1919. Aged 39 years. A brave soldier. "Would God, I had died for thee. Absolom, my son, my son." 2nd Samuel. 18 Chapt. 33rd verse.